There’s the Pixar I remember. With Inside Out, Co-Writer/Director Pete Docter—Director of the Oscar-winning UP and the Oscar-snubbed Monsters Inc.—has created not only one of the best Pixar films in years, but one of the best Pixar films period. 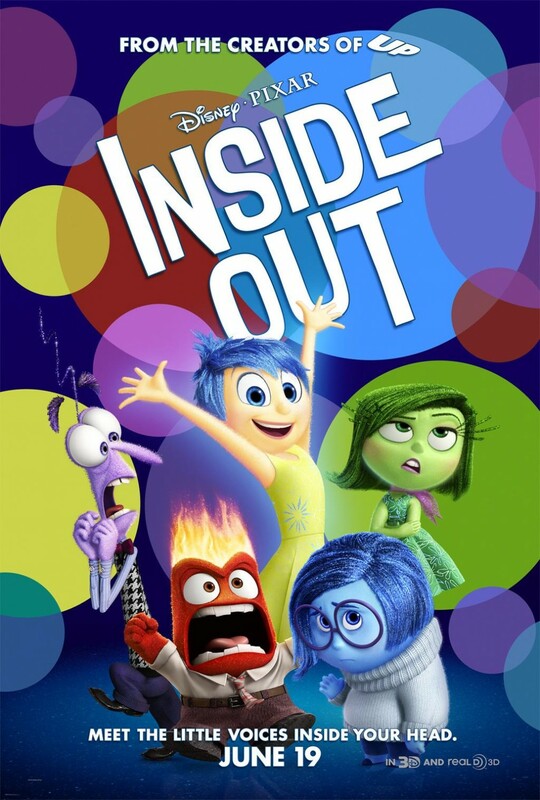 The story of Inside Out takes place in the mind of Riley (Kaitlyn Dias), an eleven-year-old girl who loves hockey, her family, and being goofy every once in a while. In Riley’s “control room,” there exist five emotions governing her behavior: Joy (Amy Poehler), Sadness (Phyllis Smith), Fear (Bill Hader), Disgust (Mindy Kaling), and Anger (Lewis Black). Joy is the leader and the majority of Riley’s memories are happy ones, especially her “core memories,” the memories that make up who Riley is as a person. However, when a move from Minnesota to San Francisco occurs, Riley’s emotions are thrown into turmoil. Sadness is compelled to touch one of the core memories and when she does it turns blue—as opposed to the yellow of Joy. Then, as Joy tries to fix the damage of Sadness’ actions, she and Sadness are sucked out of the control room and must find their way back through Riley’s mind. Along the way, they meet different elements of Riley’s mind including her old imaginary friend, Bing Bong (Richard Kind), who tries to help the two on their journey. Meanwhile, back in the control room, without Joy’s steady hand to guide them, Fear, Disgust, and Anger get Riley into trouble—trouble that she may not be able to come back from. Joy and Sadness need to not only get back to the control room, but learn to work together before it’s too late for Riley. What results is a hilarious, but deeply touching film that rights the ship after several recent misfires from Pixar. Inside Out is a fantastic film. It has enough wondrous elements to keep kids engaged, but the themes the film touches on are very adult and will melt even the coldest heart. You will laugh a lot, but by the end, you may be weeping. The world of the mind that Docter and his team create here is marvelous and very clever. What could have been dismissed as Herman’s Head for kids turns out to be very sharp and funny. The film hearkens back to the Pixar films of old by appealing to kids on the surface, but having deeper meanings that resonate with adults. It should take its place among the pantheon of Pixar’s best. The voice talent is perfectly cast and they work together to great effect. Poehler is a strong anchor, which she proved in her stint on Parks & Recreation. Her Joy is much like Leslie Knope in that she’s an eternal optimist. Smith’s quiet, morose tone totally suits Sadness, while Kaling has the unenviable job of voicing the emotion that’s hardest to explain. They call her Disgust, but it is explained much better in the film as she prevents Riley from getting poisoned. However, she does have elements of Kaling’s personality in there as she comments on fashion and what’s hip. Hader does a great job channeling Fear, but it is Lewis Black who personifies his character to a tee. Black is the perennial “angry comic,” so who better to voice Anger? Kind is fantastic as Bing Bong, who is truly a lovable character. I had a feeling that Bing Bong might turn into Stinky Pete from Toy Story 2, but happily, he remains a faithful companion to Joy and Sadness. Diane Lane and Kyle MacLachlan give nice performances as Mom and Dad, while Dias is likable as Riley. She does a good job making Riley a character you want to root for. Inside Out is, as of right now, the best film of the year. Without seeing any other animation films for the year—including Pixar’s second feature of 2015, The Good Dinosaur, which debuts in November—it will easily win the Best Animated Feature Oscar next year and may be a lock for a Best Film nomination as well. This is a film you have to see. Pixar is back and it feels great. This entry was posted in Reviews and tagged 2015, Amy Poehler, Bill Hader, Bing Bong, Film Reviews, Films, Hodgepodge, Inside Out, Lewis Black, Mindy Kaling, Movie Reviews, Movies, Pete Docter, Phyllis Smith, Pixar, Podcast, Richard Kind, UP. Bookmark the permalink.